On August 5, thousands cross the country sat at their computers watching the landing on Mars of the rover Curiosity live on NASA TV. MHC’s Professor of Astronomy Darby Dyar stood in a crowded room at the Jet Propulsion Lab in Pasadena, California. At 10:30 p.m., surrounded by hundreds of other scientists and engineers, Dyar watched as the six-wheeled Curiosity touched down on the surface of Mars. Viewers everywhere were awestruck by the success of the complex and risky landing, and the team responsible for Curiosity’s journey didn’t hold back their emotions. “There was not a dry eye in the room,” Dyar recalls. But even as the celebration reached its height, the energy in the room shifted. Once the Mars Science Lab—launched eight and a half months before—had completed its journey of 345 million miles, there was new work to be done on one of NASA’s most ambitious missions ever. As Dyar put it, “The engineers had gotten the rover to Mars. Now it was time for the scientists to get to work.” Dyar is one of those scientists. She first became involved with the Curiosity project in 2005, when she learned about the NASA Mars Science Lab and its aim—to analyze the chemical composition of the Martian surface. She knew that the catalog of rock samples she’d amassed over the years could be useful. Imagine if, each day, you had to go to work forty minutes later than the day before. As a member of the team of scientists on Earth working on the Mars Science Lab project, MHC astronomy professor Darby Dyar spent her fall doing just that. Because a Mars day, or “sol,” is approximately twenty-four hours and thirty-nine minutes long—and because the Mars rover Curiosity must work in daylight due to temperature fluctuations and visibility needs—team members must constantly adjust their schedules so that they are working during Mars’s daytime. 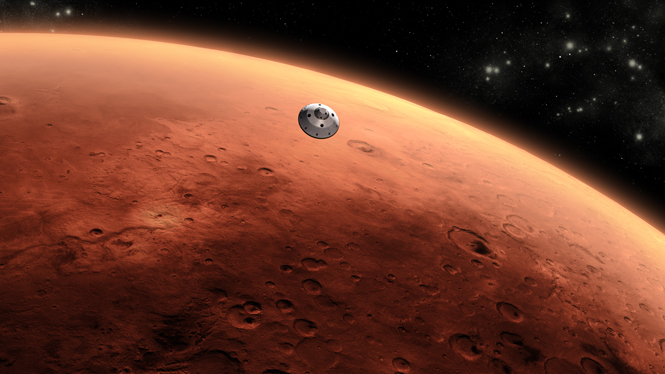 Because Curiosity is nuclear-powered, it could travel the red planet for a decade or more. At some point, Dyar says, the scientists will switch their own schedules back to Earth time. But this fall, everyone was expected to live on Mars time, even as they were continuing to walk on the Earth. A geochemist, Dyar studies how hydrogen and oxygen are distributed throughout the solar system, in part by analyzing rocks from deep within the Earth’s core as well as meteorite samples from the Moon and Mars. Throughout her career, Dyar had categorized thousands of samples, now housed in her lab at Mount Holyoke. 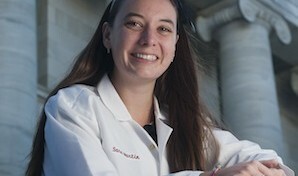 In what she calls an “uncharacteristically” brave move, Dyar contacted the builders of a Mars-bound ChemCam instrument, telling them, “I have samples that might be useful as standards for your instrument.” That well-timed email put her on the team that designed and built a laser that would send data from the rover to labs on Earth for analysis. Three NASA grants totaling nearly $1.4 million have supported this work and that of more than a dozen Mount Holyoke and Five College astronomy students. 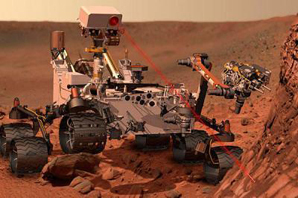 In this illustration, the rover’s ChemCam zaps a rock with a laser. The heat generates gases that are analyzed by spectrometers. These data will reveal a sample’s chemical composition. Already versed in spectroscopy and other methods used to determine the chemical compositions of rocks and soils, Dyar helped develop the first-ever laser instrument to be sent to a planetary surface. ChemCam works by shooting a laser at a rock or soil sample from up to twenty-four feet away. The sample is heated until it is transformed to plasma, a spectrum is taken, and those data—showing the chemical composition of the sample in a series of wiggly lines—are transmitted back to Earth, including Dyar’s on-campus facility in Carr Lab, where computer analysis takes place. Over the course of the Mars mission—which could last more than a decade—Dyar and her team will likely analyze thousands of unique Mars spectra. The hope is that these data will clarify where and when there was liquid water on the red planet. Where there is water, there can be life. 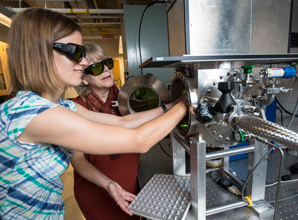 In preparation for this work, Dyar’s lab was equipped in July with a state-of-the-art laser-induced breakdown spectrometer, or LIBS. Funded by NASA, it is one of only five in existence, including one on Curiosity. Since its landing, Dyar and her team have been receiving data gathered by the ChemCam and comparing it to LIBS data acquired at Mount Holyoke for interpretation. From the beginning of Dyar’s involvement with the Mars Science Lab, Mount Holyoke undergraduates have been integral to every part of the project. Melissa Nelms ’13 is a geology major who has worked in Dyar’s lab since her sophomore year, including two summers full-time. Nelms has become skilled at spectroscopy, essentially breaking down the spectrum of each rock sample into many individual wavelengths of light, illustrated by a series of unique emission lines. Each sample provides a distinct map of its elemental makeup, and these maps are compared to those of Martian samples. As part of her independent study, Nelms also has worked to create hydrogen and oxygen calibrations for LIBS. “If all goes according to plan,” says Nelms, “my research can be used to help analyze data from the ChemCam instrument currently on Mars.” Determining the composition of a Mars soil sample’s hydrogen and oxygen—the building blocks of life as we know it—is one important step in discovering if there was Martian life. Professor Darby Dyar (right) and Marie Ozanne ’12 prepare to analyze Earth rocks, which will help them interpret analogous data coming from Mars. Marie Ozanne ’12 was a double major in chemistry and statistics at Mount Holyoke and a former thesis advisee of Dyar’s; she is now pursuing a doctorate in statistics at Ohio State. Ozanne’s work in Dyar’s lab involved identifying the best methods to use for statistical analysis, or how to know when the profile of a new rock or soil sample is statistically close enough to one already acquired on Earth. Genesis Berlanga ’11 came to Dyar’s lab his senior year after a summer internship at NASA. Berlanga, whom Dyar calls “a whiz at instrumentation programming,” says he had “the right set of programming skills to tackle the task of automating the LIBS setup in the lab.” Now lab manager for the Space Research/SRE Optics Lab at the Johns Hopkins University Applied Physics Laboratory, Berlanga still is involved in the Mars Science Lab project. “I work long-distance and come to Mount Holyoke every few months to update and maintain the software for our LIBS setup,” he says. That geology class was so “profoundly enlightening” that Dyar took more geology courses and, along the way, rediscovered the world through her new scientist’s eyes. As a senior, she worked in a lab at MIT with her adviser’s colleague, who encouraged her to apply to MIT’s graduate program. Although Dyar had envisioned field geology, the graduate program funding was for analyzing lunar samples—both those brought back by missions to the moon and those that landed on Earth as meteorites. She launched a career studying planetary sciences, never imagining that the once-in-a-lifetime experience of being part of a NASA mission lay ahead of her. The Mars Science Lab team numbers 406 scientists, almost all of whom are employed by large research institutions. More than once, Dyar has been asked, “Why would you want to work in a place like [Mount Holyoke]?” She responds that “faculty at liberal arts colleges are world-class researchers who also respect and care about quality undergraduate teaching.” Mount Holyoke may not confer doctoral degrees, she says, but the research her students and others at the College are doing is doctorate-level. Dyar hopes that the visibility of her work on the Mars project may help to change the way people think about liberal-arts colleges. Curiosity is a high-profile mission, and it’s more sophisticated than the three previous Mars rovers. The implications of the discoveries that the Mars Science Lab is on track to make are in the news almost daily, and everyone has wanted to talk to Dyar since the landing. She’s done interviews for newspapers, websites, and radio. President Obama even called to congratulate the science team. “It’s a delightful windfall,” Dyar says of all of the attention. While Dyar is only one of a large group of engineers, scientists, and students working on the Mars Science Lab project, the data collected by Curiosity and analyzed in her laboratory may very well someday answer what Dyar calls “the most profound human question”—are we alone in the universe? She believes that determining what life looks like on other planets has the potential to reshape the human experience. What that life is, what it is made of, and what it looks like could stretch beyond the boundaries of our current imaginations. “It is incredibly exciting to work on a science team and on a current mission,” Dyar says, perhaps downplaying the significance of the project that may someday lead to the next big step: a human mission to Mars. 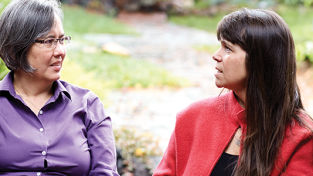 This article appeared in the winter 2013 issue of the Alumnae Quarterly. See video of Dyar discussing the Mars mission and check today’s weather on the red planet. See the latest images taken by the Mars rover’s camera. Was there once life on Mars? NASA’s lead scientist announced March 12, “From what we know now, the answer is yes.” Read more about how scientists reached this conclusion at nasa.gov/mission_pages/msl/news/msl20130312.html. The article about life on Mars was very interesting. I wrote this poem in 2011 after I heard an NPR story about the search for planets with conditions that could sustain life. then maybe we’re not alone. We’re looking for life as we know it. We’re looking for us out there. We’re looking for rocky, and warm, and wet. That’s the “zone” a life form might share. A planet must be rocky, not gassy. It must also be temperate in clime. But mostly, it must have plenty of water. Our planet, we know, is sublime. we need this alchemic elixir. Two H and one O is an elegant formula. Life from the ultimate mixer. Earth may be one in a million. Or a miracle, all on its own. That’s a stellar statistic to ponder.